The concept of the brand came about many years ago, when my life was engulfed in a wave of travelling. Huge night markets of Singapore and Kuala Lumpur, vibrant pure colors by day, a new world and a heat to completely forget what January in Europe feels like. In this world, people came in groups that only differed by T-shirts and cameras. Huge camera lenses served as surrogates for luxuries and pricy cars they left somewhere far away. Some believed status had to be sustained with obligatory bells and whistles. Others tried to fit in with a T-shirt that was different. Shapeless Chinese, fancy Japanese and conventional European – all these T-shirts added to the swirl of exotic and colorful images. A cotton print was the only way to make a statement quietly, to manifest personality and crack open a window to one’s self. This was understood by all and skillfully used by many. In Europe, the return destination, I went back to my daily routines. And at home I missed those colors; I felt something was left behind in the distant tropics. There were no T-shirts with a positive vibe, with something refined and ingenious to them. 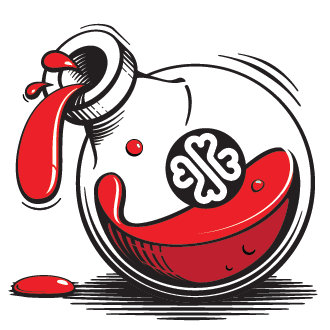 It was the concept of ingenuity and subtle humor that propelled the idea to become Lucky Syrup. Lucky Syrup is not your mass market product. It is for those who are not mesmerized by fashion or the uniform look. It does not blend you in – on the contrary, it singles you out in the crowd, reflects something individual. This is augmented by the concept of luck that follows a positive-minded and optimistic person, thus completing the notional cycle: a vibrant person chooses a vibrant article that makes him or her even more vibrant.